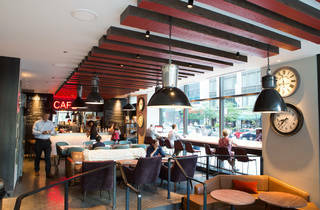 Two Zero Three, the hybrid coffee shop/wine bar located in Chicago's new Virgin Hotel, is a slickly designed spot, with silver counters, sofas and wooden tables. 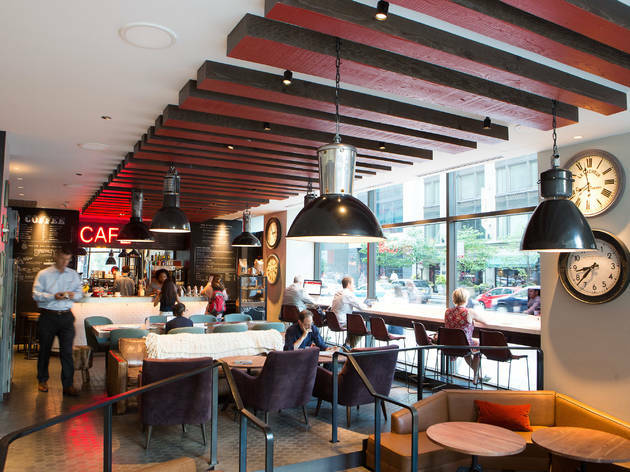 The hard environment makes this place better suited to a coffee shop than a wine bar, especially since they're serving drip coffee from local roaster Bowtruss and espresso drinks, plus they offer free Wi-Fi. For snacks, Two Zero Three serves housemade baked goods, including muffins, scones and cupcakes, and there’s a small case for cheese and charcuterie, along with a display case for Shinola products, which hints at the attention paid to design at this hotel. El stop: Brown, Green, Pink, Orange, Purple to State/Lake. Blue to Clark/Lake. Red to Lake.